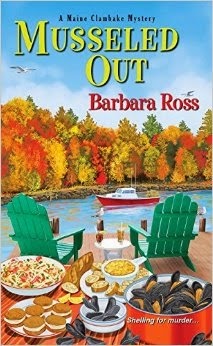 With her third Maine Clambake Mystery, MUSSELED OUT, Barbara Ross serves up a triple whammy of tight and fast-moving plot (competition! risk! death! danger!! ), complex and likeable amateur sleuth (Julia Snowden, with crises ahead), and an alluring Maine-scape of working folks, visitors, and ocean adventure. The result is what every author of a series dreams of achieving. Each book is getting better -- and the first one was pretty darned good, so by now, the Maine Clambake series is one of the best amateur sleuth (sometimes called "cozy") mystery series coming out of New England. The key to a really good mystery is the intricate chemistry that links the sleuth and the circumstances. As MUSSELED OUT opens, it's autumn on the Maine coast, and the Snowden family business, a tourist-serving clambake operation on a nearby island, has only a week left of the season -- and then it won't bring in money again until after the long New England winter. For Julia, it's decision time: Back in March, she'd taken a leave from her high-powered Manhattan money job, to rescue the family business in Busman's Harbor, Maine. Has she done enough? Should she return to her "real life" in the city? Or should she take a lease on her own apartment and give up her city job for good? If she stays, is she also committing to her new/old boyfriend, Chris Durand, with his mysterious past absences that he won't share with her? She's in love -- but is that enough to be able to trust both Chris and a shared future? As if that weren't enough, there's a new stress on the Snowden Clambake biz: Right next door to the Clambake ticket booth, on the town pier, a new ticket booth's being built for "Le Shack. David Thwing, the Mussel King." Armed with an already-famous gourmet chef, Thwing doesn't just intend to provide competition -- he tells Julia clearly that he aims to knock the Snowdens out of the game, in less than a season. So when Thwing suddenly turns up dead, caught on a drifting boat, Julia's family is under immediate suspicion -- especially her sister's husband Sonny, who's clearly lying about where he's been and what he's done during the critical time period. And, oh yes, there's a lobstering war going on at the same time; could it be linked to the heap of disasters? The most important part of an "amateur sleuth" mystery -- and MUSSELED OUT is clearly this type of mystery -- is making it crystal clear why a person like Julia Snowden would tackle the dangerous activity of trying to identify and catch a murderer. But with her family's business and possibly her brother-in-law's freedom at stake, Julia simply must step up for this one. Will it put unbearable strain on her new love relationship with Chris? As an independent individual who dashes out on a boat as needed, will it thrust her into renewed danger? You bet. While all this is rising to a crescendo of suspense and risk, author Barbara Ross keeps tantalizing readers with the best of Maine menus. It's not just the fabulous mussel recipe of David Thwing, the "mussel king." It's also Chris's shrimp and lobster polenta; a lobster, shrimp, and fennel scampi; and even "Grandma Snowden's Pumpkin Whoopie Pies." As Ross notes, "whoopie pies are the unofficial, and well-loved, state snack of Maine." Mouth watering? Check the recipes at the back of the book. Ross admits, as she has before, that she relies on her husband Bill for the seafood delights, although the baked goods are her own contributions. I noticed an intriguing author mention on the whoopie pie recipe that suggests a direction for the next book, too, where Ross points out that we "haven't learned much about Julia's father's side of the family so far in the series" -- hmm. True enough. The folks at risk in MUSSELED OUT, like the ones in Clammed Up and Boiled Over, are Julia's siblings and mom. Wonder what's up with all that? I'm definitely hooked on this series ("hook, line, and sinker"! ), and plan to re-read MUSSELED OUT later in the summer as part of my beach-or-back-porch reading basket. (Release date is April 28, in case you want yours ASAP.) Can you read this one without the first pair of Clambake Mysteries? Sure. Ross does a nice succinct job of summing up critical earlier events from the other books without distracting from the pace of murder, mayhem, and investigation. But the best pleasure would be from devouring all three books, one after another, savoring that Down East Maine atmosphere and exhilaration. Why not? All three, from Kensington Books, where the line of mysteries just keeps getting better (and yummier).